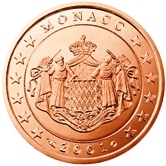 Monaco has issued two attractive series of standard coins (change of monarch) as well as the most expensive Euro Coin yet issued - the Grace Kelly Commemorative. 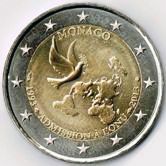 Monaco was one of the founding members of the Euro Zone.It started issuing coins in 2001. Some basic facts relating to Monaco. 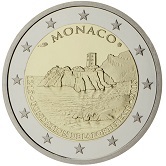 Monaco is one of the three states (the others are San Marino and the Vatican) that ,although not members of the European Union, nevertheless issue their own Euro Coins. Of the initial members of the Euro zone it is the only one that commenced minting in 2001. 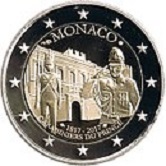 Monaco has issued some wonderful coins and is a good niche collection area for those who are financially secure. It is, with the Vatican, a member of the Euro zone many of whose coins are beyond the reach of most collectors. It has the distinction of having issued the most expensive Euro coin to date - the 2007 Two Euro Commemorative of Grace Kelly, currently costing well over € 1.000. 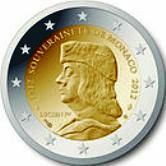 Monaco Euro Coins (also sometimes called Monégasque Euro Coins) are divided into two mint series. One running from 2001 until 2005, the other from 2006 up to the present. 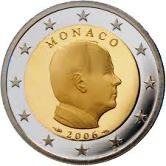 The change in mint series was occasioned by the death of the Prince of Monaco, Rainer III in 2005. 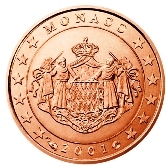 1cent,2cent and 5 cent - Coat of arms of royal family Grimaldi. 10 cent, 20 cent and 50 cent - Seal of the Prince. 1 Euro - Effigies of Prince Rainer III(left) and Prince Albert (right). 2 Euro - Effigy of Prince Rainer III. 1cent,2cent and 5 cent - Coat of arms of royal family Grimaldi. The design is different from the first series - somehow more compact and not with such clean cut lines. 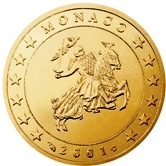 Also the name "Monaco" and the date now appear within the inner circle. 10 cent, 20 cent and 50 cent - The crowned monogram of Prince Albert II. 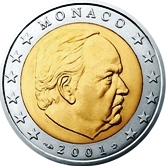 1 Euro - Effigy of Prince Albert II of Monaco. 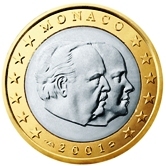 2 Euro - Effigy of Prince Albert II of Monaco. 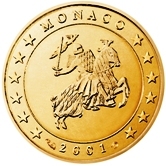 Around the rim of the two Euro Coin appear 2s alternating with "**", every 2 being inverted with respect to the preceding and following 2. 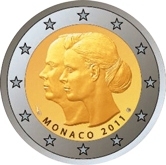 Monaco Commemorative Two Euro Coins. 2007 -25th anniversary of the death of Princess Grace of Monaco. 2011 - Wedding of Prince Albert II and Charlene Wittstock. 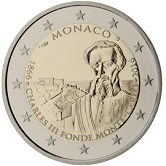 2012 - Depicted is Lucien I. Commemorated is 500 years of Monaco sovereignty. 2013 - 20 years membership of the United Nations. 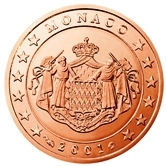 2016 - 150 years since the founding of Monte Carlo. 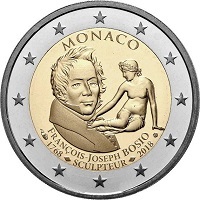 2018 - 250 th Anniversary of the birth of the sculptor Francois Joseph Bosio. 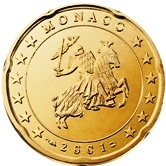 Return from Monaco Euro Coins to Links to Specific Countries. 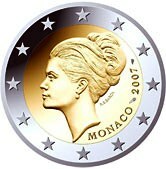 Return from Monaco Euro Coins to euro coin collector.